It took us an hour and a half to drive from Frederick to the Residence Inn Dupont Circle, 2120 P Street, NW, phone (202) 466-6800, fax (202) 466-9630, reservations: 1-800-331-3131, where we would stay for three nights. This brand new inn is a superb value! It is situated in the northwest district, home to most of the hotels, restaurants and interesting neighborhoods. The hotel has underground parking and is within easy walking distance of the Metro. It incorporates all of the latest Marriott standards and is superbly managed by Cheryl Haughton and her staff. School breaks were responsible for the hotel being fully booked by families and business people and everyone we spoke to was highly complimentary of the service and attitude of the staff. The suite was very large with a full kitchen, desk area, L-shape sofa, good size TV, queen size bed and a lovely bathroom and vanity area. The exercise and guest laundry facilities were excellent. Off the lobby there's a lounge area with TV and sofa, which adjoins the seating area furnished with tables and chairs and a buffet bar, where a hot and cold breakfast buffet is served daily. Monday through Thursday evenings snacks ranging from hamburgers to desserts on a rotating basis and soft drinks are served from 5:30 to 7:00 in the evening. Breakfast and the early evening weeknight offerings are included in the room rate. We found this hotel and lots of great info for our trip to D.C. on the eTravel DC web site. Our first stop of the day was to be the U.S. Holocaust Memorial Museum, 100 Raoul Wallenberg Place, SW. The Dupont Circle Metro station is a five-minute walk from the hotel and within fifteen minutes we were at the Smithsonian Metro stop, a block away from our destination. The Metro system is superb. The fare machines, metro maps and signing are easy to understand and there were always enough helpful personnel around if you had a question or a problem. People in Washington, in general, deserve mention here for the way they seemed to go out of their way to respond to requests for information or directions. They're very knowledgeable about their city and willingly share what they know. Because the nation's capital belongs to the people, admission to all the government buildings, monuments and museums is free. Timed passes to the U.S. Holocaust Memorial Museum are required only for the permanent exhibition. Same day passes are available at the Holocaust Museum. Advance passes can be procured from Pro Tix (1-800-400-9373). Building hours are 10:00-17:30 with extended hours in spring and summer. Group reservations can be addressed to group_visit@ushmm.org. The Holocaust Museum is America's national institution for the documentation, study and interpretation of Holocaust history and serves as the country's memorial to the millions of people murdered during the Holocaust. From the brilliant architecture to the riveting exhibitions the goals have been achieved. The permanent exhibition, "The Holocaust", is a self-guided tour where visitor's usually spend two to three hours, starting on the fourth floor with the Nazi Assault (1933-1939), continuing to the third floor, Final Solution (1940-1945), and ending on the second floor with the Last Chapter, Hall of Remembrance, Wexner Learning Center and Museum Art. The first floor houses the Hall of Witness, a hands-on exhibit Remember The Children, Daniel's Story, the Donors' Lounge, the Museum Shop and Museum Art. The concourse level features the Wall of Remembrance (Children's tile wall), special exhibits, an orientation film that visitors are encouraged to view on arrival, the Gonda Education Center and Museum Art. The collection of artifacts, photographs, films and eyewitness testimonies painstakingly presented in the permanent exhibition makes the Hall of Remembrance truly a place for individual contemplation. To view four photos of the Holocaust Museum, please click here. Although the Metro easily whisks you from one location to another, we preferred to enjoy the city center on foot. Walking along the wide avenues, appreciating the impressive government buildings, historic monuments and numerous beautiful museums, we were completely awestruck by the magnificence of the national capital. We strolled along Independence Avenue and decided to visit the most popular museum in the world, the Smithsonian's National Air and Space Museum. It's a fun place for viewing the airplanes and space modules with lots of hands-on stuff for the kids and for serious air and space enthusiasts, lots to learn. A block away is the Hirshhorn Museum and Sculpture Garden, which is the Smithsonian's Museum of Modern and Contemporary Art. The works of Robert Gober and Leonardo Drew were on display. Gober does household art, from sinks, pipes and drains to furniture. Sorry Robert, not our cup of tea. Drew's large wall-mounted sculptures that comment on his black, southern heritage and America's industrial past are very striking and powerful; Linda wasn't impressed. Dupont Circle is a colorful, eclectic neighborhood and the two blocks between the circle and our hotel contain many wonderful, good value restaurants. We had decided there was more than enough variety to choose from and that we would confine our dinners to the neighborhood. Next door to the Residence Inn is BeDuci, 2100 P Street, NW. An attractive glass atrium front that opens in good weather, with fresh herbs growing in planters outside, leads into a sophisticated contemporary dining room, where we were seated. Simple light-colored walls adorned with lovely artwork create a relaxing dining ambiance. Our cheerful waitress knew the menu and was quite helpful and efficient. We found the menu of the day to be of more interest than the printed menu, as we think it should be. Linda's salad of Shanghai endives, vine tomatoes and avocado was tastefully arranged in layers and dressed with rich Gorgonzola cheese. My fresh mussels and clams were steamed in a refreshing fennel broth. The jumbo sautéed soft shell crabs were served with penne al pesto and a tender, center cut swordfish steak was grilled with sage and preserved lemon zest and presented on a bed of julienne vegetables and roasted red potatoes. Warm pineapple cobbler with vanilla ice cream was a perfect closer. It was a delightful dining experience. If you're a wine aficionado, BeDuci has an award-winning wine selection of over 500 varieties. We arrived at the White House visitors' gate at 7:45 in the morning only to find out that visiting had been cancelled for the day. It seems Bill Gates and a few other movers and shakers were meeting with the President this day. This is not an uncommon occurrence as the passes are issued a couple of weeks in advance and changing schedules at the White House often necessitate closures. Fortunately the sign said that our passes would be honored the following day. It was a bright, sunny, cool day and we headed southwest to the Constitution Gardens for a visit to the Lincoln Memorial, Vietnam Veterans Memorial and the Korean War Veterans Memorial. We walked along the path adjacent to the reflecting pool that runs the length of the gardens to the Lincoln Memorial, which is built in the style of a Classical Greek Temple. As the majestic sculpture of Lincoln became visible, it was a most stirring moment. Turning to leave, we realized that an afternoon visit would have been the opportune time to visit. From that spot the views of the Washington Monument and the Capitol to the east and the White House to the north had the potential to be stunning photographs but not in this blinding sunlight! 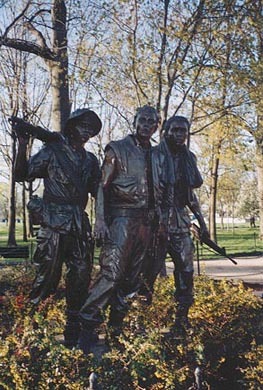 The two war memorials flank the Lincoln Memorial and are powerful tributes to the veterans of Vietnam and Korea. We tried to go on the tour of the FBI building but it was closed for the day. In fact, when we returned the next day, the wait was two to three hours. This is one of the most popular tours in the city and there are no advance passes available so it seems one must arrive at seven in the morning to be sure to get in with a minimum wait. Across Pennsylvania Avenue from the FBI building is the Old Post Office. This beautifully preserved treasure was constructed in the 1890's as a technological marvel; its 315-foot height made it the tallest building in D.C. at the time. Designed as the headquarters of the Postmaster General of the U.S. and the U.S. Post Office Department, as well as the site of the city post office, the building gained fame not only for its striking architecture, but for housing Washington's largest uninterrupted enclosed interior with two glass ceilings arching over the huge interior. It was the first Federal building constructed along the hollowed stretch of Pennsylvania Avenue from the White House to the Capitol. Today the lower floor houses a food court with government agency offices on the floors above. There's a glass elevator to the 270-ft. outdoor observation deck in the clock tower. Inside and out, this is a gorgeous building. We stopped next at the National Archives on Constitution Avenue to view the Charters of Freedom: The Declaration of Independence, The Constitution, The Bill of Rights and The Magna Carta.